Hello again ! 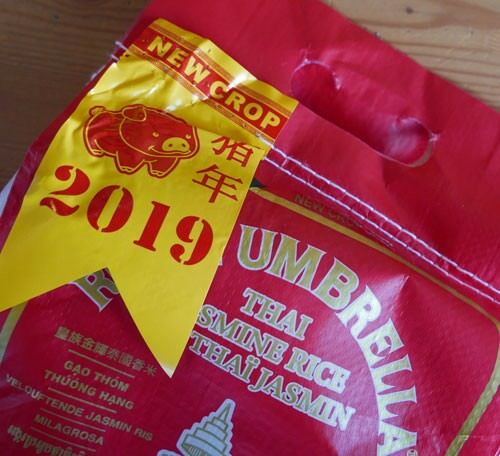 We just today received a shipment from Thailand of 2019 New Crop jasmine rice, always an exciting time because of the unique character of freshly-harvested fragrant rice. Brand new fresh (2019) crop rice just arrived on January 16, the very first arrival. Rice this fresh is slightly wet, with bright, strong jasmine aroma. Within 8 weeks or so, the rice will harden up and lack the really young character, but also be more firm after cooking. If you like jasmine rice, try this unique fresh crop. We started offering Aroy-D instead of Por Kwan brand several months ago, and feedback is excellent. We're selling more Tom Yum Paste than ever, with restaurants ordering this by the case. Highly authentic, makes preparing Tom Yum as easy as ever. Steel so hard with an edge that stays so sharp can only be hand crafted, but what's wrong with that? See every step in our new series on knives made by master craftsmen in Japan. Japanese knives hand shaped by master craftsmen before being sent to off for hours of sharpening.